The MATT / SEMI-GLOSS CLEARS system consists of two versatile 2K acrylic urethane clearcoats designed to reproduce a range of low gloss levels for the specialised repairs of vehicles or areas of vehicles originally finished with a low gloss clearcoat over a single or multistage colour basecoat system (e.g. Mercedes full body Matt Finish). 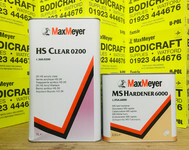 To allow for the normal gloss variations – due to colour, model, postion of repair on vehicle etc., the actual mix of the two Clearcoats can be varied to match the vehicle to be repaired.